Greg McFarlane and his brother, Wain, have always shared a special bond. Together with their brothers Julian and Micah, the siblings founded the reggae band Ipso Facto in the early 1980s in Minneapolis, and have spent most of their lives making music together. "We eat, sleep and play together," says Greg. "He's my friend, my brother, my everything." So when Wain came to Mayo Clinic for a kidney transplant on Feb. 26, 2008, there was no question Greg would be there by his side. He was also there to support another family member: niece Yai Tieh, who was donating one of her kidneys to her uncle, reports KARE-11 TV. After visiting Wain after his surgery, Greg tells us he remembers being glad it wasn't him. But five years later, Greg found himself following in his older brother's footsteps when he, too, was diagnosed with kidney disease. And last year, after years of dialysis, he was told he would need a kidney transplant to survive. "Without one I would die," Greg tells KARE-11. "There's no 'maybe' about it." Enter niece Angela Graham. "When I heard Uncle Greg needed a kidney, I went and got tested to see if I was a match," she tells us. She'd done the same thing when it was her Uncle Wain in need. Back then, her sister Yai was the best match. This time, Angela got her chance to donate as the most compatible potential donor. 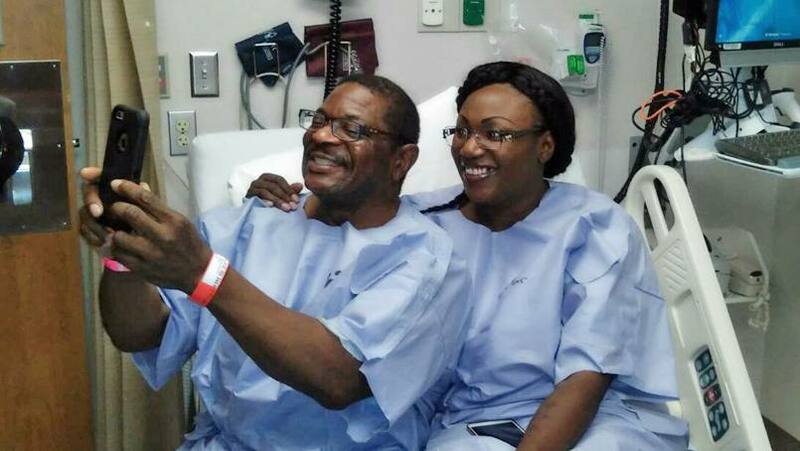 "I prayed about it, and then told my uncle, 'My kidney's yours,'" Angela says. It was a decision made easier by seeing her sister thriving years after her donation. "Seeing her alive, healthy and being able to do everything was really helpful," says Angela. But the biggest encouragement for giving was "seeing my uncle Wain living still," she says. So on Feb. 26, 2016 — eight years to the day after Wain's transplant — Angela donated one of her kidneys to Greg. The date was special for another reason: It's Greg's birthday. "Because the transplant was done on my birthday, I got to be reborn," he says. "Now, we can all celebrate together on that date every year." Greg says he's still trying to put into words the gratitude he feels toward his niece. "What Angie did has redefined the word 'gift' for me," Greg tells us. And he's already planning ways to pay that gift forward. Before his transplant, he and Wain organized Kidney Rock, a benefit to raise money to offset Angela's expenses as a donor. He's planning to make the fundraiser an annual event, with proceeds going to support other organ donors. He's also planning to develop a program to help alcoholics with renal failure "focus on eating right and thinking right" as a way to postpone dialysis. For her part, Angela tells us she's glad she "was able to be the chosen one to help my uncle out." And she encourages anyone in a similar position to give the gift of life. "I have no regrets," she says. "If anyone has a chance to donate, they should do it." We're sure you'll have no regrets after sharing your comments below and sharing this story with others.